Spectrum High temperature (HT) air filter range offers from high temperature sliced media pad type or as framed box filters, This HT range has developed a filtration system to meet clean air environment at oven application. Filtrair FHT 1000 uses glass fiber media bonded together into a uniform high efficiency mat. The media pack is encased in a fine expanded metal housing for high temperature applications. 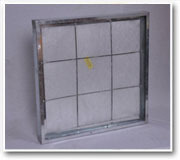 The filter layer of special media on the air exit side to ensure that fibers do not migrate in to the air stream. The clean air side is identified by a sticker. FHT 1000 filter is designed for application in drying oven for automotive industry. The filter is constructed from a special grade of lint free microfine glass fiber media to withstand temperature upto 300°C. usually put in a reusable holding frame. They are very well suited for use as oven application for Surface finishing technology industries. Filtrair High Temperature synthetic fiber air filter media is constructed from temperature resistance high performance fibers bonded into a web like structure to separate coarse particles from contaminated hot air streams in industrial processes. The media is designated to separate tar, soot and rust particles out of hot air from high temperature curing ovens to prevent fouling of product surface. The IHT 1000 is an extended surface, high temperature filter, design with rigid construction. The filter utilizes a glass media that is pleated in construction. Spectrum high-temperature filters are used for air filtration applications involving temperatures > 100°C (> 212°F) up to 400°C (752°F). The silicone - free filter media are made of special, temperature-resistant glassfibre paper with high mechanical stability and moisture resistance. Microglass paper separators maintain the pleat distance. Protection grids on both upstream and downstream side also prevent damage to the filter medium. The protection grids and the filter frame consist of galvanized steel, to reduce the risk of particle shedding caused by the constantly high temperatures. Spectrum high-temperature filters are equipped with a temperature-resistant gasket to preclude leaks.